Countertops are one of the highest use areas of your home so it is important to choose wisely and pick a quality material. Stay away from things that are easily scuffed, scratched, stained, or melted. Formica, tile, or other alternatives do not offer the durability or quality that you’ll find in a hard surface option, and they can often harbor stains, mold, and germs that are impossible to clean. Worried about the cost of a material like granite, marble, or quartz? 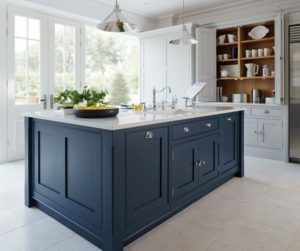 Do not despair – there are an infinite number of options in natural stone and quartz within a large range of pricing, so you won’t have to compromise style if you’re trying to work within a budget. And, these are the by far the most durable countertop options you can think of, so you won’t have to worry about replacing them any time soon. It is important however to be sure to choose a material that is fitting for your lifestyle and personal style – for example, granites are a natural material that come in a HUGE variety of colors and characteristics, and offer a more unique custom look, while quartz is a man-made option that will allow for a slightly more modern, streamlined look with less variety. Our design team are experts in almost every stone and every brand of quartz and can easily help guide you within your budget and lifestyle needs. 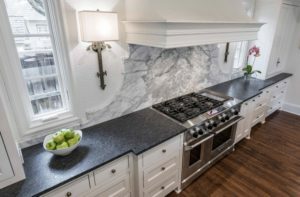 Your backsplash on the other hand is not going to to suffer anywhere near the abuse of your countertops, so it is a great area to save a bit of dough. With so many tile options out there, we are certain you can find something that meets your style desires but won’t break the bank. We work with most every vendor in the Denver area and can either sample options to you directly from our showroom, or can coordinate with each supplier to bring in options that we might not be able to house in store. Once your selection is made, our expert installation teams will get to work. 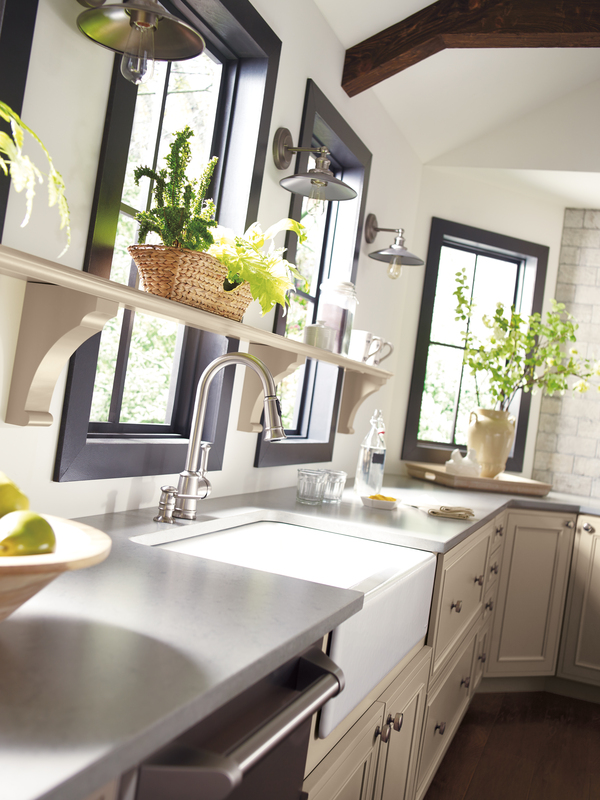 Cabinets are the component of your kitchen that will do most of the heavy lifting – literally and figuratively. They are of course one of the most used features of the kitchen but they also hold up your countertops and house all of your dishes, pots, pans, and other storage needs so they make a big impact on function. 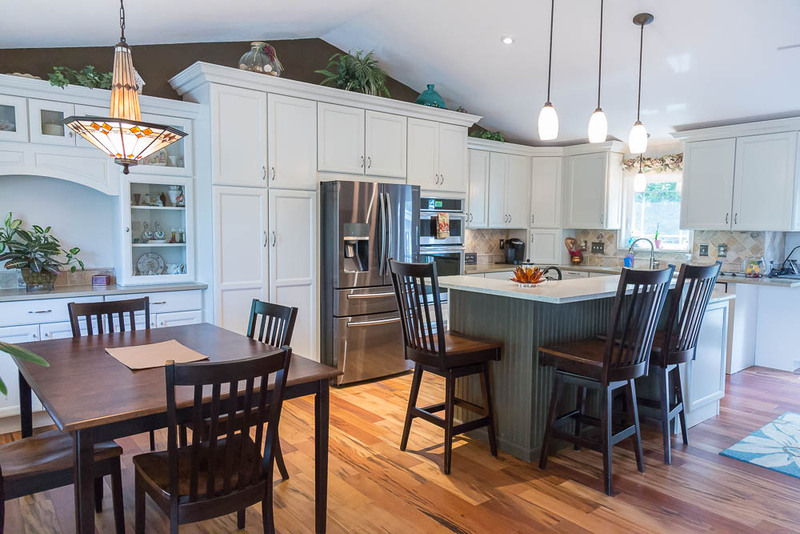 Cabinets can also be one of the most difficult things to replace, even above and beyond countertops and flooring and the design and layout of the kitchen can make or break the space. For all of these reasons, we recommend that this is a area not to skimp. We offer all of the popular cabinetry brands like Aristokraft, Kemper, Decora, and Kraftmaid Vantage, and even offer a fully custom option with Tischlerei. Yes, some of these brands can be found at your local box store but don’t be fooled. The box stores often offer these brands in a “light” package – meaning that they don’t offer all of the available options from each vendor or may have a limited catalogue to choose from meaning you may not get the design or features that are best for your family. With our team however, the sky is the limit – we offer full catalogues, all the custom features of each brand, and are uniquely trained and partnered with each of our vendors to help provide the very top-of-the-line experience while staying within any budget constraint you might be needing. And, of course, if we can’t fulfill your dreams in the traditional brands, we can always go fully custom if your heart desires. Now, we understand that sometimes, nothing sets off your gorgeous cabinets and design like some fun, functional, design inspired hardware. However, we really think that this is somewhere that you can save – no need to go all in on bling. And, since these are usually easily replaceable options, you can always change them out as your style or the style of the times change. Lighting can be a make or break feature of an otherwise perfectly designed kitchen. But as mentioned before, you don’t need to go out and spend all of your money on an expensive lighting package, especially if you have access to natural light streaming in through windows or large doors. That’s where our design team can really shine and bring the light into your home. We believe that designing kitchens AROUND those natural features, helping to decide on replacement windows or doors as needed, and then helping you choose ideal places to include any additional lighting can make all the difference. We also pride ourselves in partnering with trusted local businesses to help you find unique lighting solutions with experts you can trust that you won’t find in the big box stores. We like to be clear upfront that if you are not a very frequent or active cook, an oven is a great area where you might be able to save. Ovens are relatively simple and can last for a long time without much maintenance. A quality stove, however, even if it is not the top-end option, is where you don’t want to skimp. If you are a passionate, frequent cook, save room in your budget for a good-quality, long-lasting range with a good warranty and that promises to last for many years. We also recommend looking for an appliance that is easy to maintain AND replace parts for. For small appliances (i.e. coffee makers, toaster ovens, and microwaves etc. ), you might be tempted to go get high-quality, gourmet items, but these are actually great features to save on. They’re all available in relatively good quality, and incredibly cheaply these days, and far easier to replace than a range or oven would be. Believe it or not, even if you have a large family, and do lots of cooking, you can usually find a way to save on a refrigerator. With so many brands and options available, you can easily fulfill your functional needs, without breaking the bank. When it comes to shelving and pantry however, this falls back to the category of cabinetry. You’ll want to be sure to choose a sturdy, quality, long-lasting options. And even though it might not be a huge portion of your overall cabinetry budget, dry food storage that’s accessible, durable, and stylish, is a great small investment to make for the overall function of your kitchen. 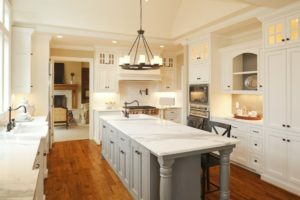 Quality investments aren’t necessarily a big splurge, but choosing to spend more for a longer-lasting, more reliable, and high-quality product will, in many cases, be a much smarter use of your precious kitchen renovation dollars. Goodbye grey and white. Hello statement pieces! With the new year in swing, what better time to start thinking of ways to renovate, refresh, and organize your life. And, where better to start than the heart of your home – your kitchen! These 5 design trends are sure to inspire you to be a better and brighter you – or at least have a better and brighter kitchen in 2018. According to Stephanie Pierce, director of design & trends at MasterBrand Cabinets, “Blues and greens emerged as ‘go-to’ color choices for cabinetry in 2017. They are being mixed with other colors, complementing wood stains or even being used as the dominant color alone”. Blue and greens made a splash everywhere from high-end design firms to almost every kitchen show on the DIY and HGTV networks, and we think this trend is here to stay. These colors offer a way to bring a unique but classic element to your home that will capture your guests attention and offer a timeless complement to all of your interior designs through the years. We are a proud distributor of MasterBrand Cabinets, carrying the FULL lines of Aristokraft, Kemper, and Decora – not just the limited lines you’ll find at the box store showrooms. 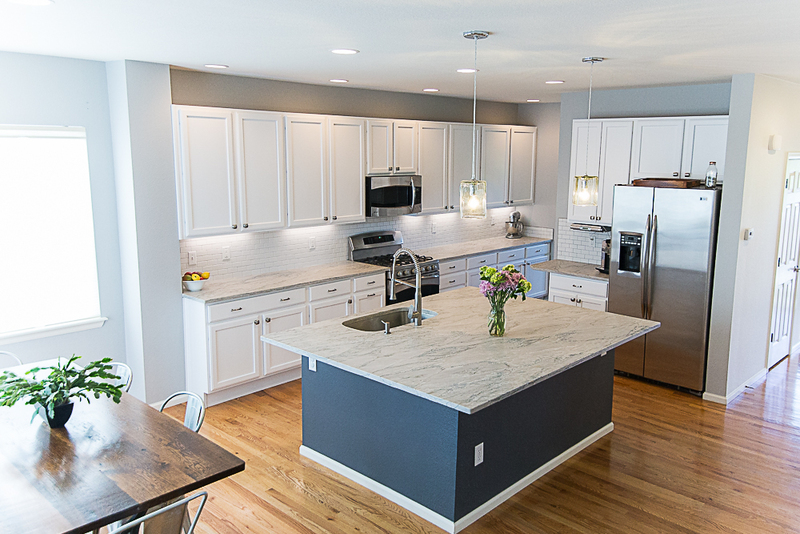 We also offer fully customizable lines of Kraftmaid and Tischlerei cabinetry and our team knows all of the design trends and can help customize your space to meet your kitchen goals that will last for years to come. The Color of the Year Is….. Purple! Ultra Violet to be exact. Pantone announced that the 2018 color of the year is Ultra Violet, stating that the vibrant choice is “complex and contemplative” and that “Ultra Violet suggests the mysteries of the cosmos, the intrigue of what lies ahead, and the discoveries beyond where we are now. The vast and limitless night sky is symbolic of what is possible and continues to inspire the desire to pursue a world beyond our own”. Pantone, which clams to be “the global color authority,” began announcing and naming a “Color of the Year” starting in the new millennium, finding trending colors from all over the world, in everything from cosmetics to cars. 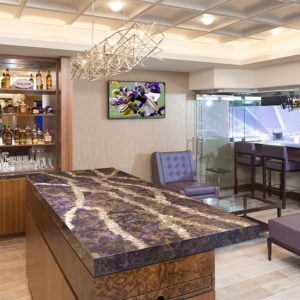 Well known, American-made, and luxury quartz supplier Cambria even announced a partnership with the 2018 NFC North Division champion Minnesota Vikings in 2017, fueling “Purple Pride” by offering created 11 bold, custom Minnesota Vikings-inspired quartz designs, many featuring rich purple tones in unique marbling and veining. The custom designs are installed in premium clubs and suites, including The Medtronic Club, Mystic Lake’s Club Purple and Delta Sky360 Club. With their PRINCETOWN™ quartz, one of the striking Viking designs, you can even bring some of the “Minnesota Mirale” into your home! Weather it be Ultra Violet purple quartz from Cambria, or a more neutral design choice, our team is standing by and able to show you almost any color of quartz you can dream of from all of the leading brands. Move over white quartz – the 2018 renovation year is all about making a statement, and we think this is a trend that will continue for years to come. One way to get this done is to make your kitchen island a conversation starter, a piece of art, and a way to add drama and style to your new space. 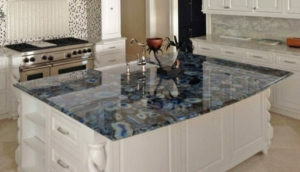 Whether it be a stunning blue agate counter top like this stunning accent island, or a waterfall granite edge with dramatic contrasting veining, find a piece that really speaks to you and bring some character into your home with this easy step. Because natural stone is so unique, it is impossible to keep true, up-to-date samples of what’s available, in our showroom. But not to worry! Ware partnered with all of the local stone yards, and can easily help guide you on your search for the piece that speaks to you. Just swing by our office for a list of our partners, and we’ll offer some guidance on how to best search their inventories, get your actual piece picked out, held and delivered to our fabrication facility, and eventually installed in your dream kitchen. If you can’t get on board with the high-drama statement pieces, maybe a more subtle and classic approach is more your style. Luckily the 2018 trend of dark countertops is a classic look that not only has stood the test of time, we know it’ll continue to be a popular option for years to come. And, to add a touch of flair, most the darker natural materials can also be honed, or leathered on the top surface or chiseled on the edge for a way to add some different texture and uniqueness to your project. According to Sue Wadden, the director of color marketing at Sherwin-Williams, this year, it’s all about mixing and matching color. And, this is nothing new. The days of a monochromatic kitchen design are a distant past and our clients love mixing and matching to make a boring kitchen something to talk about. 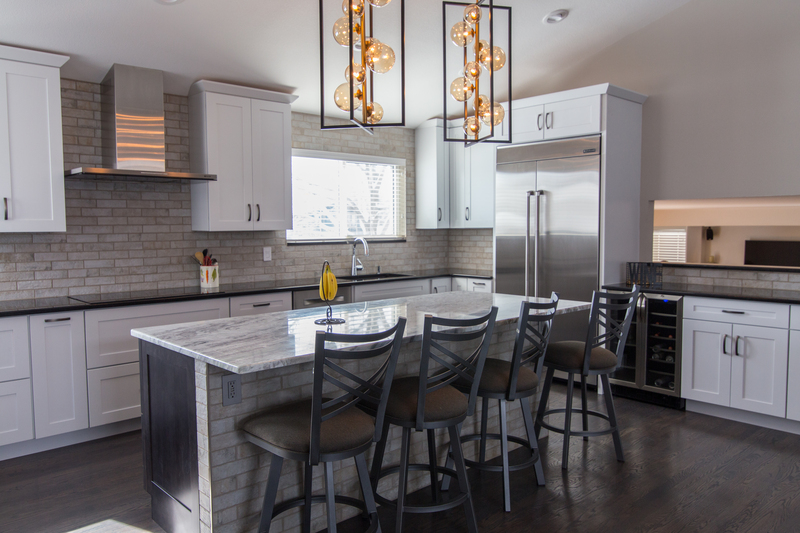 Using multiple colors will continue to be a popular trend this year – from darker lower, and lighter upper cabinets to contrasting colored islands, we want to help you make your new kitchen something to talk about. 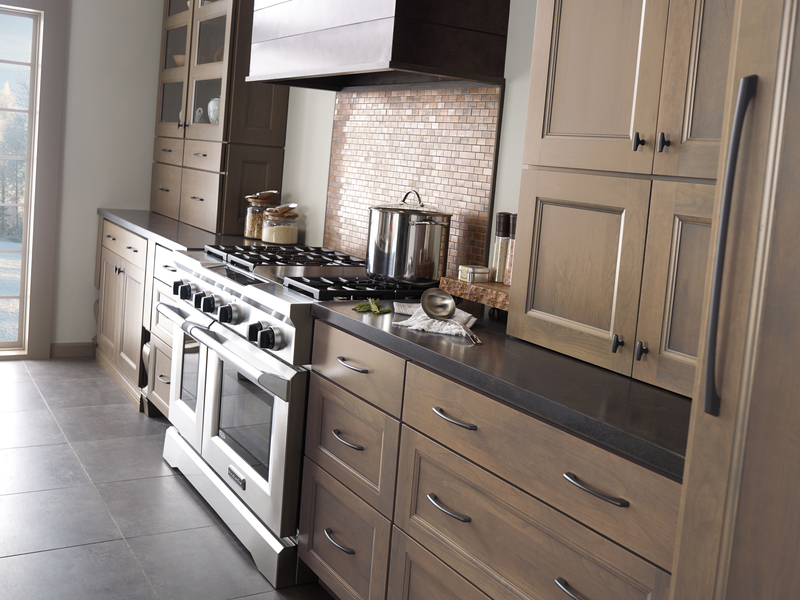 Luckily, the style is the limit with our fully customizable cabinetry lines. We can achieve this look with contrasting stains, or multiple paint choices, or a combination of both. Decora by MasterBrand Cabinets, will even allow you to choose a custom color from ANY one of the Sherwin-Williams paint colors, or even match to your favorite throw pillow… if you can dream it, we can do it! We are so excited to announce this new blog! Don’t miss out on the latest design trends, updates on projects, and news from our team by following our posts! We are so excited to bring this new way to keep in touch and share our design ideas with you.